odds are you are going to see more than your fair share of injured knees over the coming years. Luxating patella, cruciate ligament rupture and torn meniscus are things you may see on a daily basis, so it’s critical that you develop a solid understanding of the anatomy of the canine knee from an early stage in your veterinary career. Without fail, anytime we demonstrate EasyAnatomy to a practicing veterinarian one of the first things they ask to see is the knee. Most vets tell us stories about trying to demonstrate knee injuries to owners through a combination of textbook images, plastic models and hastily hand-drawn doodles. 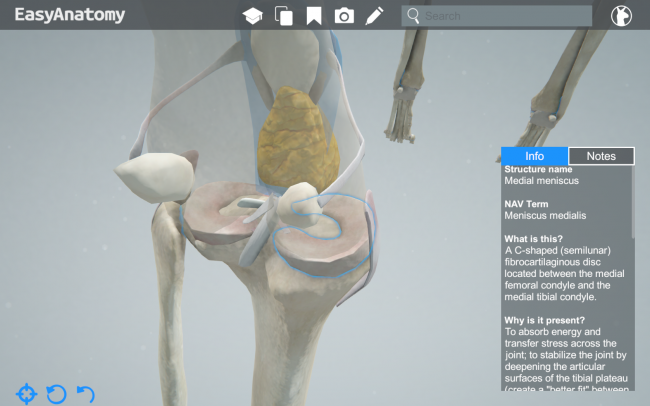 One of the huge advantages of interactive 3D, is that you can examine 3D structures such as the canine knee with much greater precision, ease and clarity. 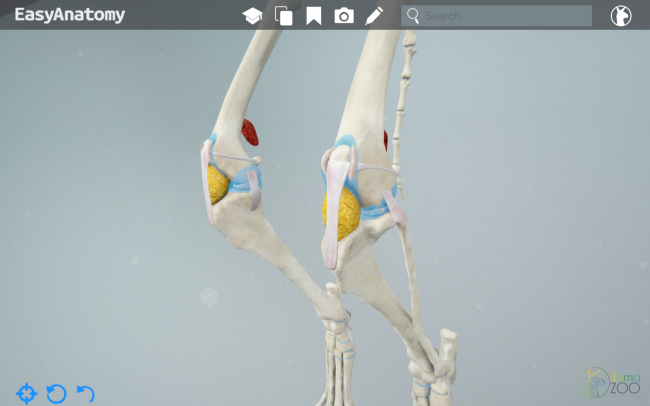 This post highlights some of the key elements of the anatomy of the canine knee, and includes information such as why the structures are present, their clinical significance, and associated ligaments. What is this? The portion of the tendon of insertion of the quadriceps femoris muscle that courses between the patella and the tibial tuberosity. 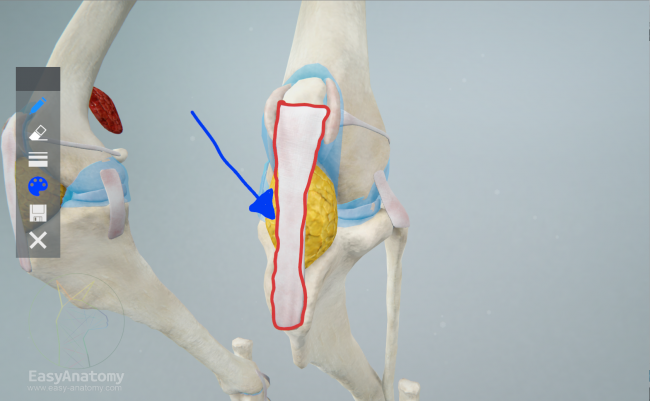 Notes and Importance: The patella, the largest sesamoid bone in the body, is intercalcated within the deep surface of the tendon of origin of the quadriceps femoris muscle. What is this? This ligament extends from the lateral epicondyle of the femur to the head of the fibula (with a few fibers attaching to the lateral condyle of the tibia). The lateral collateral ligament courses over the tendon of origin of the popliteus muscle (which arises from the lateral femoral condyle). The lateral collateral ligament does not have any distinct attachments to the lateral meniscus. Why is it present? The collateral ligaments limit medial and lateral rotation of the tibia when the stifle is extended and limit lateral rotation when the stifle is flexed (the cruciate ligaments limit medial rotation when the stifle is flexed). The lateral collateral ligament is taut when the stifle is extended and lax when the stifle is flexed. The ligament prevents the tibia from rotating medially at the stifle (varus deviation of the stifle) when the limb is extended. Notes and Importance: The collateral ligaments develop from the fibrous layer of the femorotibial joint capsule on each side stifle. The collateral and cruciate ligaments are often referred to as femorotibial ligaments. Clinical Significance: It is possible to check the integrity of the collateral ligaments by palpating the stifle and attempting to cause varus and valgus motion of the tibia. What is this? Articulation between the medial femoral and tibial condyles and lateral femoral and tibial condyles. Why is it present? Allows for flexion and extension of the stifle. 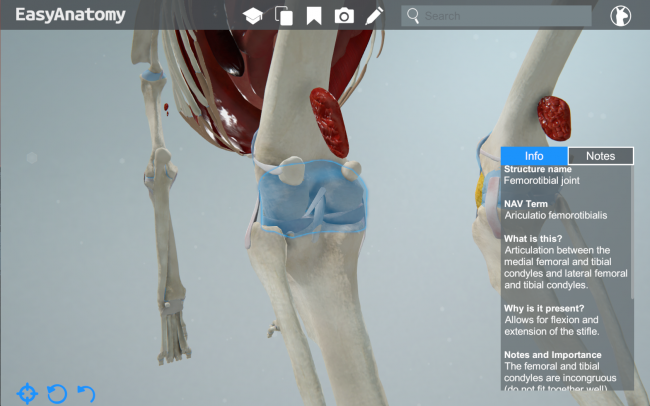 Notes and Importance: The femoral and tibial condyles are incongruous (do not fit together well). Fibrocartilaginous menisci located between the condyles improve the congruency of the joint. Associated Ligaments: The four femorotibial ligaments are the medial and lateral collateral ligaments of the stifle and the cranial and caudal cruciate ligaments. What is this? A C-shaped (semilunar) fibrocartilaginous disc located between the medial femoral condyle and the medial tibial condyle. Why is it present? The absorb energy and transfer stress across the joint; to stabilize the joint by deepening the articular surfaces of the tibial plateau (create a “better fit” between the femoral and tibial condyles); to lubricate the joint; to prevent synovial impingement between the articular surfaces of the femur and tibia. Notes and Importance: The peripheral portion of the meniscus is thicker than the central portion. The menisci develop from the fibrous layer of the joint capsule and are covered by synovial membrane. The medial meniscus is tightly fused to the medial collateral ligament (this relationship is not observed between the lateral meniscus/lateral collateral ligament). Associated Ligaments: Each meniscus is attached to the tibia by a cranial and caudal meniscotibial ligament. The medial meniscus does not have an attachment to the femur. Clinical Significance: The medial meniscus is susceptible to damage by becoming wedged between the medial femoral and tibial condyles when the joint is unstable (e.g. with cruciate ligament injury). What is this? An intra-articular (but extrasynovial) ligament that courses from the caudomedial part of the lateral femoral condyle to the cranial intercondylar area of the tibia. Why is it present? Provides stability to the stifle preventing the tibia from sliding cranially (with respect to the femur) when weight is placed on the limb. Together with the caudal cruciate ligament it prevents hyperextension of the stifle and limits medial rotation of the stifle, particularly when the joint is flexed. 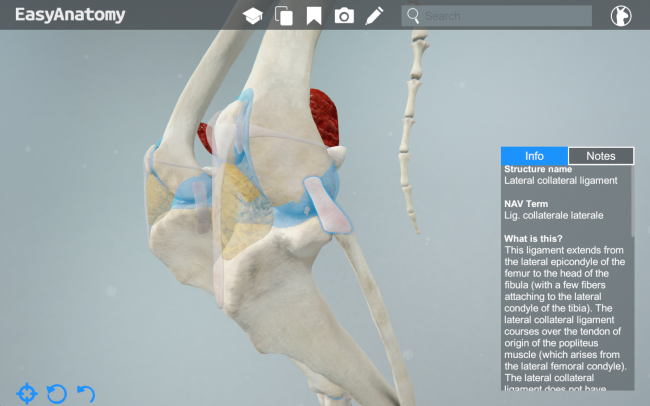 Notes and Importance: The cruciate ligaments are named for their attachments to the tibia; the cranial cruciate ligament attaches to the tibia cranially. The ligaments cross each other in the intercondylar fossa of the femur. The cranial cruciate ligament is located laterally to the caudal cruciate ligament. Clinical Significance: Cranial cruciate ligament rupture is a common condition in dogs. A technique used in diagnosis is evaluation of the cranial drawer sign. This is done by grasping the distal femur in one hand (index finger on patella, thumb on lateral fabella) and the proximal tibia in the other (index finger on tibial tuberosity, thumb on caudal aspect of the tibia) and attempting to move the proximal tibia cranially, with respect to the femur. If the cranial cruciate ligament is intact, very limited movement is possible. Damage to the cruciate ligament permits increased movement, depending on the degree to which the ligament is compromised. Treatment of cranial cruciate rupture may range from conservative (in small dogs) to surgical. A few of the common surgical procedures include extracapsular stablization, tibial plateau leveling osteotomy (TPLO), and tibial tuberosity advancement (TTA). All of the information and images in this post are taken from EasyAnatomy. The content is all written by our team of veterinary anatomists, and the goal is always to focus on the things veterinary students are most likely to need to know for exams, and for clinical practice. For a similar overview on the canine digestive system, be sure to check out our next post in this series. 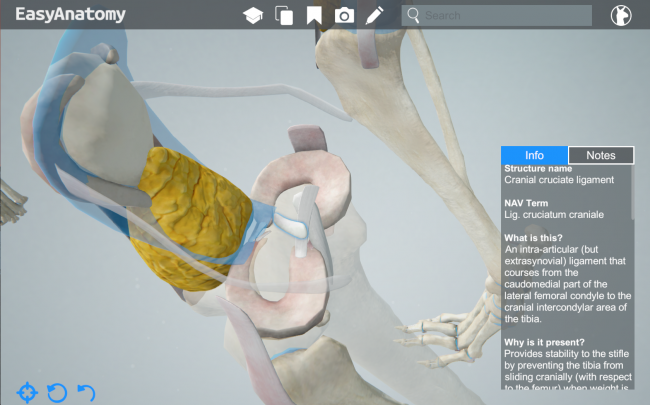 Visit our homepage to learn more about why schools such as the University of Pennsylvania, and students from over 60 schools across the world trust EasyAnatomy for their veterinary studies – www.easy-anatomy.com.